What is Cloud Management Suite? Cloud Management Suite is an easy-to-use, powerful, and predictive IT management software solution that delivers advanced and automated features to IT teams from various organizations and markets, allowing them to remotely manage their entire infrastructure from the cloud by simply using a web browser, keep the devices and systems on the infrastructure up to date, detect and troubleshoot security vulnerabilities and issues, reduce costs, and increase their productivity. The solution is developed by Verismic Software, a leading global provider of cloud-based IT and endpoint management solutions that help organizations and IT professionals boost efficiency, increase savings, and improve the security status of their infrastructure. Cloud Management Suite is designed in such a way that it can be used to track all IP-enabled devices that are connected to the network or also known as Internet-of-Things (IoT) devices. It ensures that such devices do not contain threats that will expose the other devices on the network to security attacks and issues. 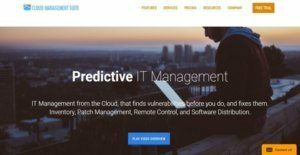 Cloud Management Suite uses a predictive patch management technology that automatically detects vulnerabilities in unpatched devices and systems, and delivers the needed security patches and software updates. With its remote control capabilities, any endpoint and system can be remotely managed from a single solution without the need for deploying a remote control software or client. Users can also access their work computers and devices from any location and mobile device. The IT management solution also automates the process of installing and distributing software across the organization. Software deployments can be executed as part of scheduled maintenance tasks. In addition, it provides network discovery and inventory tools which enable users to identify all the devices on their network in real time and gather data related to their hardware and software components. Cloud Management Suite offers features that streamline the tasks of helpdesk agents wherein they will be able to access records that show all software deployments and configuration changes that have been made. Last but not least, the solution implements a two-factor authentication method that protects the logins of authorized users and ensures that they are able to seamlessly access the network. Remote management and control is regarded as one of the unique features present in Cloud Management Suite. With this feature, IT professionals can manage any device, system, and endpoint within their organization on any browser-enabled device and from any location. They will be able to do this without the need for installing and running any third-party remote control agent or client. Instead, the solution is using a remote control tool that can be accessed in the cloud. This tool leverages the latest version of HTML which is HTML5. As a result, devices and applications that support such advanced markup language can be remotely viewed and managed from any web browser. As the solution permits users to remotely manage and control any device, system, and endpoint on their network, it makes sure that all activities and tasks done remotely are recorded. This way, the persons who performed such tasks can review the things they made any time they want so they can prepare for security audits and comply with the requirements being demanded by such audits. Another remote capability of Cloud Management Suite is that it allows IT professionals to securely access the desktop computers and any devices they are using in the office from anywhere, whether they are at home or they are attending a business meeting somewhere else. Thus, if they need to access files from their desktop computer or retrieve reports for presentation purposes, the remote desktop access capability of the solution enables them to do that anywhere using any browser-enabled device connected to the Internet like a smartphone or tablet. With Cloud Management Suite, deploying security patches and software updates across devices on a network is done automatically and efficiently. This is because the solution provides an automated patch management technology that can actually identify the vulnerabilities that unpatched devices on a network might be exposed to even before users find out about them. This predictive patching feature of this technology utilizes a vulnerability scoring system called CVSS or Common Vulnerability Scoring System, a method that assigns numerical scores to vulnerable devices and translates the scores to different severity or criticality levels. Thus, the automated and predictive patch management technology detects and rates vulnerabilities based on the CVSS scores calculated for every missing patch. This way, users can gauge and qualify which vulnerable devices need immediate attention. Once the vulnerable devices are identified and rated, they will be able to immediately deploy the required patches and updates to remediate the vulnerabilities; keeping their devices up to date and secure. The automated and predictive patch management feature of Cloud Management Suite is enhanced by custom reporting. This means as users deploy security patches and software updates, the solution lets them access overviews and reports that show details on all patching activities they have made and enable them to verify whether the patching strategies they have implemented are working or not. Cloud Management Suite also makes the process of deploying applications and programs across the devices on the network a breeze. Applications and programs are instantly distributed globally from a central location in the cloud, eliminating dependency on expensive deployment technologies and the need to minimize bandwidth usage. In addition, the solution comes with an interactive wizard that helps users define what deployment method they are going to use and how low long the deployment task will be carried out. They can also incorporate software deployments to any maintenance plan they set up wherein they can create schedules for deployments and define how often the deployments will be executed. The IT management solution provides IT teams with the capability to gain complete visibility of all devices on their network. Through the aid of its network and inventory tools, they will be able to perform a comprehensive inventory of all their devices on their network and quickly identify every device connected to it, regardless of how large the network is and how many devices they are managing. As they discover devices on the network, the solution gathers data that permits them to drill down to the software and hardware components of each device. The solution also has the ability to automatically group devices according to their IP address. Thus, the devices can be organized into different networks and sites, streamlining device discovery and inventory, and helping users save time and energy as they perform administrative tasks. Cloud Management Suite can detect not only laptops, desktop computers, and servers but actually all devices that have an IP address which include desk phones, printers, smart home devices, internet gateways, media servers, remote control tools, wireless devices, and even office coffee machines. This makes the solution ideal for managing and monitoring Internet-of-Things devices or those devices that are capable to connect to a particular network and send and receive data over the network. The solution ensures that users are able to discover all IP-enabled devices on their network, even if these devices are running on an isolated on-premise network or outside the cloud-based network. This way, they can determine whether such devices are infected with ransomware or have threats that can exploit the vulnerabilities and loopholes of the other devices, leading to serious security issues. Support tickets and helpdesk calls are often made because software deployments and device configurations are sometimes accompanied by issues. In order for helpdesk agents to clearly understand what causes these issues, Cloud Management Suite lets them access historical records and data about their device inventory. Here, they will be able to track all the software that have been previously installed on the devices, those that have been uninstalled, and all the reconfigurations that have been made on the software and devices. In addition, the solution uses color codes so that they can easily identify the specific changes that were made. They can also compare two inventories that were performed on separate dates so that they can pinpoint changes better. Furthermore, Cloud Management Suite can organize unauthorized software installations into separate tabs, permitting users to view all software and programs that are connecting to the network and violating the security and compliance policies they are adhering into. This inventory history feature of the solution helps users secure their network, and at the same time, troubleshoot issues faster. Lastly, Cloud Management Suite enables IT teams to implement an advanced identity and access management method known as two-factor authentication. Through such method, team members can access their network using pieces of information other than their username and password. Thus, they will be able to present information that they can receive through SMS, Google authentication, or email; providing an added layer of security for network access. This advanced authentication makes sure that authorized individuals are able to easily access the network without worrying about their identity and login credentials being stolen by hackers and fraudsters. If you are interested in Cloud Management Suite it could also be beneficial to check out other subcategories of Best Cloud Management Software collected in our database of B2B software reviews. Each enterprise has its own characteristics, and may call for a specific Cloud Management Software solution that will be designed for their business size, type of clients and staff and even specific industry they deal with. It's not wise to count on finding an ideal services that is going to be suitable for each business regardless of their background is. It may be a good idea to read a few Cloud Management Suite reviews first and even then you should remember what the software is intended to do for your company and your employees. Do you need a simple and intuitive app with just elementary features? Will you actually make use of the complex tools needed by pros and big enterprises? Are there any particular tools that are especially beneficial for the industry you work in? If you ask yourself these questions it is going to be much easier to locate a trustworthy service that will fit your budget. How Much Does Cloud Management Suite Cost? Basic Plans Start At $60/Mo. For more information on Cloud Management Suite’s Power Manager and Enterprise editions, please contact the vendor and get your quote. We realize that when you make a decision to buy Cloud Management Software it’s important not only to see how experts evaluate it in their reviews, but also to find out if the real people and companies that buy it are actually satisfied with the product. That’s why we’ve created our behavior-based Customer Satisfaction Algorithm™ that gathers customer reviews, comments and Cloud Management Suite reviews across a wide range of social media sites. The data is then presented in an easy to digest form showing how many people had positive and negative experience with Cloud Management Suite. With that information at hand you should be equipped to make an informed buying decision that you won’t regret. What are Cloud Management Suite pricing details? What integrations are available for Cloud Management Suite? If you need more information about Cloud Management Suite or you simply have a question let us know what you need and we’ll forward your request directly to the vendor.